The back button on your browser does not yet work with this web application. Instead, use the location buttons on the WHERE? page. If your GPS location becomes available, then a button to use it will appear here after you click the WHERE tab. You must specify a location before a map can be displayed. You must specify a location before any businesses can be displayed. You must specify a location before any news can be displayed. You must specify a location before any polls can be displayed. The location words you entered were not recognized. Please watch the interactive prompt messages that change as you enter your location words. The saved location was not found. We apologize for what is probably a software bug. Please enter the city and street names again. Cannot find an intersection near the supplied latitude and longitude. The cause of this failure is unknown. Does your GPS location work with other websites? If so, please use the contact page to report this error, and please include the names of the nearest intersecting streets. Ooops! What have you entered? It is not recognized. Hint: You can enter a two-letter U.S. state abbreviation. This is useful for finding smaller cities, such as Kent OH instead of Kent WA, and Vancouver WA instead of the larger city of Vancouver in Canada. Hint: Instead of entering full street names, such as “dolphin way, southwest 5th street”, try using just the most unique and significant words, such as “dolphin, southwest 5th”. Ooops! Periods and abbreviations are not allowed, except when they appear in the official city or street name. For example, use “street” instead of “st.”, but “st. louis” is OK. The examples demonstrate what can be typed into the box. After you click an example button, you can come back here (to the WHERE tab) to see how the location was specified. Yes, move this news item to this intersection. No, not this intersection. Let's try again. Click on this map to change location. A more detailed map will become available within 20 minutes. Map tile images are © Open Street Map contributors. The Open Street Map button (above) takes you to the Open Street Map (.org) website, centered at this location. Anyone — including you — can add missing information to the Open Street Map data. Searches that involve postal codes use data from www.GeoNames.org. Some governments (such as Canada) do not allow public use of all characters in their postal codes, and in those cases only the first few characters are used. To get more information about a news item, click its button. If you know the link (URL) to a description of a yard sale, estate sale, block party, or other special event in this city, please enter the intersection on the “WHERE?” page, click the “Go Here” button, then click the “Add special-event news to this intersection” button. If you know the link (URL) to official police or fire news at this location, please click the “HERE” tab, then click the “Add news source at this city or district” button. Scheduled events involving police, fire, sheriff, etc. Content from copyrighted news sources (such as yard-sale announcements from local newspapers) is presented here with the intent of increasing the motivation for people to submit their news to those publications. Content from police departments and other governmental agencies is presented here with the intent of reducing crime and increasing economic prosperity for the region. If a news source wants to have its news removed from this website, an authorized representative can request removal using the Contact Us page, and that request will be honored after verifying that the request is coming from the correct domain name. Note that before adding a news source the site's copyright terms are consulted and honored. To get more information about a business, click its button. Non-chain restaurants, delicatessens, bakeries, cafes, tea shops, bookstores, and hardware stores are listed here for free. The other businesses listed here are NewsHereNow sponsors. Eating places are color-coded by distance (from orange to pink); all other businesses are colored green. Most business names and locations are from Open Street Map (.org). If a business name, or location, or website, is not correct in the Open Street Map data, please correct it there. If a qualifying neighborhood business does not show up on the Open Street Map (.org) website, please add it there. This is the estimated standard time at this location, at the time you most recently requested news. The actual hour at this location is unknown because the hour is affected by politically-chosen time-zone boundaries that might be near this location, and this website does not track those boundaries. Also, some regions use “daylight savings” adjustments, and those adjustments are not tracked. News is updated regularly, but not instantly. If your preferred language is not listed, and if enough people in your region want to use this web app in your language, please inform us — in English — using the contact page. A loud explosion in our quiet neighborhood triggered the idea for this website. About two weeks later we learned what caused the explosion. The news arrived in a printed neighborhood-based newspaper that is published just once a month. That's crazy! It shouldn't take weeks for news to travel just seven blocks. When you visit this NewsHereNow website, you automatically download some magic. That's because the NewsHereNow website is actually a “web app.” This means it's a single webpage that behaves as if it's an “app.” Why is this significant? Is this website really free to use? And will it stay that way? Yes, this website is free to use, and it will always stay free. Police-news followers, yard-sales enthusiasts, foodies, and lost dogs now have a newspaper that is customized for their neighborhood. The magic of computer technology automatically generates a unique edition for any intersection in the world, and delivers it over the internet for free. Our vision is to increase the economic prosperity of your neighborhood. Yet helping you requires that a few financially successful people help us grow from a one-person project into a community that supports and runs this valuable communication platform. Here is your opportunity to become a hero! The “C” corporation named Fovationz, Inc. owns this newspaper, and hopefully soon the shares of this tiny corporation will become available to accredited investors. If you are a certified accredited investor and want to be notified of any such financial developments, please contact us at “shares” at “fovationz” dot com. For additional information, please read the other “About” pages here. Sample special events: farmers market, artists market, community theatre production, book signing, etc. A special event must be open to the public for the hours specified. If the cost of attending the event is excessive, the event may be deleted as being of limited interest. Why should this news item be deleted? Yes, my reason is personal. And I know that if one person acts at a level of ethics that is significantly higher than the other person's level of ethics, then other people will be attracted to the person who has stopped behaving childishly. And I know that when two people do not get along with each other, both people are behaving in ways that are childish. Yet I still want to delete this news item! National (non-local) poll choices should appear in a moment. Currently there are no national (non-local) polls. Local polls cannot be displayed until a location has been specified. Currently there are no local polls at this location. Election polls will allow you to communicate with your neighbors in a very useful way. Knowing which political candidates are most popular — and least popular — in your congressional district (for U.S. residents) or parlimentary riding (for Canadian residents) allows you to know whether you can mark your ballot according to your first choice. Or whether you must mark your ballot for a lessor of evils in order to defeat the popular-with-your-neighbors candidate you strongly dislike. Besides election polls, there will be a few non-political polls. Why? So you can experience how voting really should be done, namely using 1-2-3 ballots and pairwise counting. To ask questions about better ballots and better vote-counting methods, join the discussion on Reddit in the r/EndFPTP subreddit. The requested poll will appear here in a few moments. Your ballot is being sent to the News Here Now server. Your ballot has been cast. You can vote in only one election poll, with only one ballot. You can change your mind and cast a different ballot, even in another election poll, but your most recent ballot will replace all your previous ballots. If you attempt to exceed this limit, all your attempted ballots will be trashed. Leaving some preference levels empty does not help your favorite(s). It will replace any ballot you previously cast. George Fobes and Don Fobes — their hard work earned the money that (posthumously) made this website possible. This website is dedicated to them, my father and brother. For legal reasons this website makes no promises of any kind, and this website has no obligation to you regarding accuracy, dependability, privacy, correctness, completeness, up-to-date-ness, or usefulness. Your use of this website indicates you agree to all the legal “terms” (limitations) written here (above and below). If not, you must exit this website now. Regarding dependability, a loss of news information is likely when a news source changes the way in which its news is coded. (Currently there is no standard way to code police reports.) When this situation happens, please again supply the news source location (its URL), and after “manual” (programming) adjustments are made, then the revised news source will replace the previous news source. You must be 18 years of age or older to use this website because the descriptions of some crimes and events may not be suitable for reading by minors. If you are younger, or might be offended by descriptions of some crimes or events, you must exit this site now! Use of this website assumes you are not offended by descriptions that are intended to be read by adults. However, if you click a link that takes you to another website, the other website may track the fact that you expressed interest in a news event or business or map view that they associate with a specific location. Additionally, if law-enforcement officials have reasonable suspicion that a user of this website might have committed a specific violent crime, then the operator of this website reserves the right to assist law-enforcement officials by providing what little information is collected here, which consists of Internet IP addresses and specific locations viewed using those IP addresses. That information is ignored for all other users. And of course, if you request the removal of news items for invalid reasons, or if you intentionally change the location or date of a news event to the wrong location or the wrong date, then the operator of this website reserves the right to use the information collected here, for the purpose of preventing future such activities, possibly including the use of legal actions. Accidental mistakes and unintentional mistakes will be excused. This website uses SSL (Secure Sockets Layer) encryption to help protect your privacy each time information flows between your computer and our servers. However, if you are using a computer that is shared with other people, the SSL encryption does not protect your privacy from the other people who use that computer. This website uses “web storage” to store in your browser the most recent locations you requested. The stored location names appear in the buttons that are near the “Go Here” button. If your browser is well-behaved, it will not allow other websites to view the stored location information. This use of web storage is for your convenience, so you do not need to re-enter the same location repeatedly. If you want more privacy, we recommend that you use the Firefox browser and use its private-browsing mode. This website does not put cookies into your computer. If you find a cookie with our name on it, it didn't come from our kitchen. Unlike other websites that store user-specific information in an account that is linked to you or your computer, each time you use this website, no information from your previous uses is available at the website server while you use this website. This website offers a button for using your GPS coordinates as your location of interest. If you regard knowlege of your GPS location to be an invasion of privacy, please do not use the GPS button. We really, really, do not want to know where you are, we just want to offer convenience to people who appreciate convenience. This website fully complies with the European Union's General Data Protection Regulation (GDPR) because we do not collect any personal information. Specifically, we have no way to contact you, we cannot distinguish you from any other person, and we supply exactly the same news to you as to anyone else who requests news at the same location. This website avoids copyright infringement. This is why content from Facebook event pages, Craigslist pages, and news from some city law-enforcement agencies are not displayed here. If a copyright owner informs us about a valid case of copyright infringement, we will remove the copyrighted material. If a news source, such as a police department, includes your copyrighted material within their news, please contact that news source directly. If you own a trademark and you are bothered because the trademark symbol does not appear next to your trademark, please ask yourself whether your goal in life is to build a great résumé, or to inspire a great eulogy. This website includes buttons that link to content on other (third-party) websites. The News Here Now website is not responsible for that third-party content in terms of accuracy, quality, relevance, offensiveness, decency, ethicalness, or legality because that content is not a part of the New Here Now website. If a user of this website adds a link that is not relevant or otherwise might offend mature adults, please remove that news item by using the “Delete this news event” button. If you find some third-party content that is not accurate, please ask the user or administrator of that third-party website to correct that content. The information you add to this website is stored on servers within the United States of America. Legal issues shall be determined according to the laws of the State of Oregon (in the United States). Your use of this website indicates you agree to all the legal “terms” (limitations) written above. Your message was empty, so it was not sent. Only include your email address if you would like a reply. Please include all relevant details in your message. Thank you for your assistance! Please wait at least 60 seconds before you assume that something went wrong. The more words you entered, the longer this takes. The bigger the city, the longer this takes. Did you know that you can enter distinctive neighborhood names instead of cities? And that you can enter postal codes?Did you know that your news is custom-calculated for your specified intersection? Usually the news items in the upper left are closest to you, and the closest in time. Usually the news items in the lower right are a farther distance away, and farthest away in time. [future promotional message displayed while waiting for businesses]The code here has not yet been written, so please click on one of the navigation tabs.The code here has not yet been written, so please click on one of the navigation tabs.The code here has not yet been written, so please click on one of the navigation tabs.If additional information reveals that this request to edit this news item was not valid, your credibility as a reliable source for future edits will be reduced. Your change has been made. The updated information will appear in (or be omitted from) future requests for news. Thank you for helping your neighbors get information about nearby events. 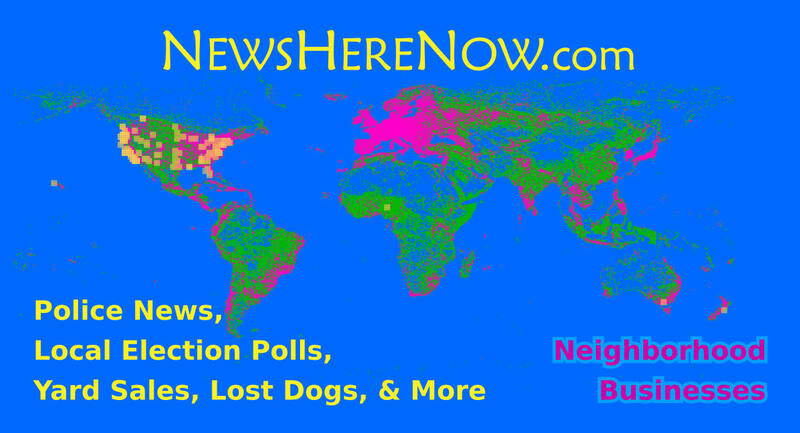 Remember to make sure your neighbors know about this News Here Now website. The intersection or neighborhood name you supplied was not found. Below are some reasons this can occur. The street might have multiple names, but the name used at the Open Street Map (.org) website is the only name recognized. One of the two streets, or the neighborhood name, might not be in the Open Street Map data. The two streets might not intersect. For example, one street might pass over the other on a bridge. Please click the “HERE” tab, and then click the “Go to Open Street Map location” button, and then scroll to the intended intersection. At that intersection look at the “official” street names according to the Open Street Map (.org) website. If a street or street name is missing from the Open Street Map (.org) website, and if you have experience editing Open Street Map data, please consider adding the street, or its name. Your information will become visible after we confirm that the event description is posted at a domain name that is checked for inappropriate content (“moderated”), similar to domains such as Facebook.com and Craigslist.org. If the unfamiliar domain name is approved, your news will appear automatically. If your submission fails this check, it will be discarded without notice (as if it were spam, an advertisement, a prank, or a submission from a software robot). This new domain name has been added to the website administrator's to-do list for verification. You do not need to do anything more. Thank you for your patience while we validate the new domain name. And, thank you for submitting news to News Here Now! The URL you supplied exactly matches the URL for another news item (that already exists). You can edit that news. Or, you can delete that news, and then add your news using the same URL. To go to the intersection that is closest to where that matching news is located, click the button below. Oops, an error occurred, and your requested change was not made. A report of this error has been sent to the website administrator. Preventing future errors like this is now on the administrator's to-do list. We appologize for this inconvenience. You can refresh the news and then try a second time, but if that attempt is not successful, then please wait at least a couple of hours before trying again. The details of this error have already been added to the website administrator's to-do list. The version of the “web application” in your browser is older than the version of the code running on the server. Please click the “refresh” button on your browser. That will load the latest version of the News Here Now “web application”. Please refresh the page. If the error repeats, please use the contact page (can you get there?) to report the error. Oops, the code running on the server is reporting an unexpected error. Please refresh the page and try again. If the error repeats, please use the contact page (can you get there?) to report the error. The News Here Now website is getting heavy use at this time. Please wait a few minutes and try again. If it is still too busy, please wait at least 30 minutes. Thank you for your patience! Warning: The descriptions of some crimes and news events may not be suitable for reading by minors, so you must be at least 18 years of age or older to read the news items within the NEWS tab of this website. If you are younger, or might be offended by descriptions of some crimes or news events written by police officers, do NOT enter a location within the WHERE tab. Entering a location and reading news on this website shall be regarded as consent that you are at least 18 years of age.